"Unheated" is a honey production philosophy centered around providing totally unheated and unaltered honey to health-oriented individuals. Part of that philosophy extends into raising awareness about what makes honey so amazing and why responsible industrial practices are so important. In an industry that values quantity over quality, we specialize in producing a honey so unique, that it stands in a category of its own. What began as a father-son hobby has, in a decade, evolved into a family-owned commercial apiary... and our dedication to producing the finest honey has only strengthened. We sell only what we produce, so our clients can be absolutely certain of the source and quality. At this time in history commercial packers dominate the industry, and honey falsification is the norm rather than the exception. We seek to challenge the status quo by exposing the health-conscious shopper to the pinnacle of honey quality. In Europe and Asia, the healing properties of unheated honey have been known for centuries. Ancient Eurasians understood that honey must be eaten in an unaltered state... and now science is hinting at this as well. Bees actively add enzymes to flower-nectar in order to ripen it into honey. These enzymes are an essential component of honey, and are believed to be the main factor in its healing properties. Studies have shown that key enzymes are responsible for honey's anti-bacterial effects. Bees store honey at a cool temperature. In such a state, all the enzymes that make honey unique, are active and bio-available. This is important for a few reasons. A complete honey, with active enzymes, will have incredible taste and aroma. In fact, when comparing heated to unheated honey on taste and smell alone, the difference is often staggering. Being unchanged from it's natural state, unheated honey is holistically superior to heat-treated counterparts. Why isn't all honey unheated? Unfortunately, in the pursuit to stay competitive, it has become standard practice to heat-treat honey in several stages. When honey is heated, it becomes much less viscous and thereby easier/more cost-effective to extract. Heat also destroys and deactivates the natural enzymes that are so vital to the completeness of honey. Stage 1: Honey boxes are first brought into a hot room to decrease the viscosity of the honey. This is done to reduce the time that the honeycombs spend in the centrifuge. Typically, temperatures in the hot-room will exceed 40°C to reduce viscosity as much as possible. Subjecting honey to an unnatural temperate for hours at a time results in measurable enzyme depreciation. Stage 2: Honeycombs then enter a mechanical "uncapper" which removes the top layer of beeswax from the combs in order to free the honey. This is done to prepare the combs for entry into the centrifuge. What this creates is cappings that are still about 50% honey by weight. In this stage the wax cappings and the honey must be separated. The most common method for separation is heating the cappings/honey until the wax melts and rises to the top; leaving pure honey at the bottom. The melting point of beeswax is 62°C, therefore the honey and cappings must be heated to at least that temperature for this method to work. This is just slightly below pasteurization temperature and extremely damaging to honey. In our honey house, we use a wax press specifically designed for wax-honey separation. The mechanical action of the press eliminates the need for heat. The honey extracted via the press, goes into our COLD-PRESSED production stream. Stage 3: After the uncapping, the combs are ready to enter the centrifuge. The centrifuge spins out the honey by virtue of centripetal force, and the honey is drained into a reservoir. At this point, the honey still has many large particles of beeswax and pollen that must be removed. This is done in the reservoir by the forces of gravity. Beeswax and pollen are less dense than honey; therefore, given some time, all impurities will rise to the surface. Honey is again heat-treated to speed up this process. Heated honey is less viscous and as such, impurities will rise much faster. This is desirable from an economic standpoint because the reservoir can quickly be vacated for the next batch. In our honey house, the reservoir is kept at room temperature. This increases the time of production, but it respects the natural integrity of the honey. Stage 4: At this stage, producers may choose to pasteurize their honey, or simply leave the honey as "unpasteurized". It's clear by now that unpasteurized honey can already be severely damaged by the 3 previous stages of heat-treating. Pasteurization is the final stage in heat-treating where the honey is heated to roughly 70°C. Pasteurized honey is incomplete, however, unpasteurized honey that has been irresponsibly produced is not any better. 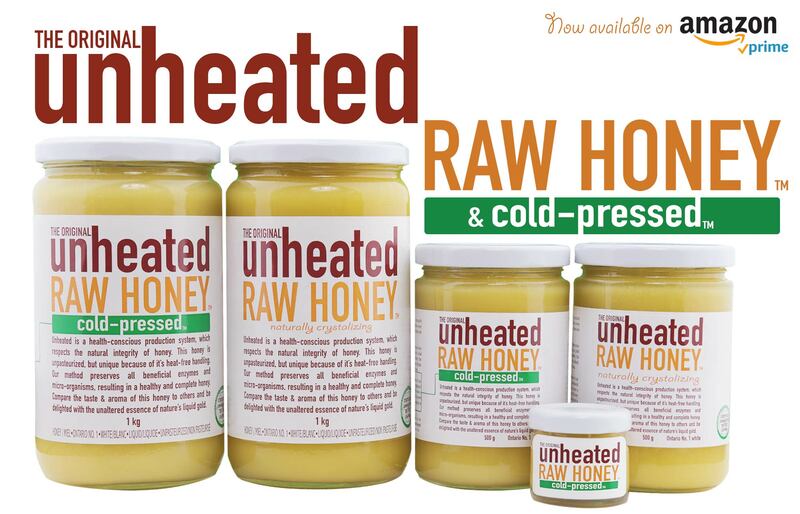 Our honey is unpasteurized, but more importantly it is also unheated. Unheated honey is superior in taste, aroma, and enzyme content. But if one were not accustomed to the smell and taste of honey, how would one evaluate its quality? Fortunately nature provides us with a reasonably accurate method of determining a honey's quality. Honey is a liquid that is naturally super-saturated with glucose. What this means is that, over time, honey that has not been heated will begin to crystalize/granulate. This is similar to the science experiment that we all did in school, where we added sugar to boiling water and then watched as the sugar re-crystalized in the fridge. Honey begins to crystalize when it is kept at it's natural temperature. Over time, the honey's saturation capacity decreases and therefore causes natural glucose to precipitate from the solution. When honey is heated, the saturation capacity is increased. The consequence of this is that heated honey will not crystalize at all or crystallization will be extremely delayed. Unheated honey, when stored at room temperature, must crystalize within 4-10 weeks. Its important to note that naturally crystalized honey is different from "creamed" honey because creaming is just another term for artificial granulation. Creamed honey can be heated or pasteurized and then artificially crystalized through the introduction of foreign crystalline particles. Fortunately there is a way to tell the difference between naturally crystalized honey and artificially crystalized (creamed) honey. Natural crystallization tends to harden in coarse particles. The size of the glucose crystals will vary somewhat from honey to honey, but as a rule; creamed honey is artificially crystalized in microscopically small crystals resulting in an unnaturally smooth consistency (ultra-creamy). Naturally crystalized honey will be abundant in quirks and personality. 1. Does not crystalize? Heated. 2. Creamed? Most likely heated. 3. Slight crystalization starting from the bottom of the jar? Unnatural crystalization pattern; Heated. 5. Very little or no aroma? Heated. Organic honey is a great idea. Unfortunately "organic" has little value if it's produced irresponsibly. At this moment, organic certification in Canada is unrealistic and far too expensive for the vast majority of beekeepers. This is why the only organic honey that is readily available is imported from other countries (mostly Brazil and Argentina). It should also be noted that the overwhelming majority of imported honey (organic and non-organic) is pasteurized. Regulations on organic honey in Canada have a long way to go before Canadian organic honey is readily available. Our apiaries are organically managed according to the regulations, however our honey is not certified organic by any regulatory body.